I have been reading I Go By Katie ever since Katie started following me on Twitter (follow me here). 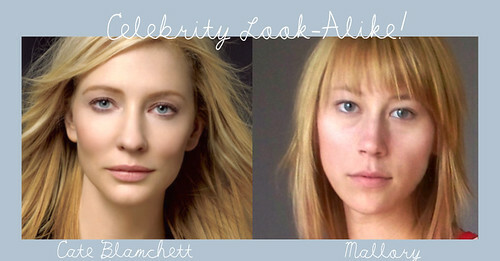 Today I came across her post of celebrity look-alikes so I decided to post one I've heard a lot lately: Cate Blanchett. Of course that's a really flattering one, so I don't mind. I hope your weekend was lovely. I plan on working every second until the RV dress line launches. Today I made an itemized schedule and I'm feeling pretty good! After the launch though I plan on taking a day or two off. YAY, big rewards! Love, Mallory.